Program Task Force kick-off to an exciting start! Program Task Force member Rochelle with a group of eager young drivers (and drivers-to-be)! The smell of gear grease and the clanking of wrenches hovered over a group of curious girls during Girl Power Meets Horse Power (No Boys Needed), the inaugural event of GSSGC’s exciting new Program Task Force. Two of its members, Terri Blomker (High Desert) and Rochelle Reynoldson (Central), used their experience as Troop Leaders to offer the program specifically for Cadettes, Seniors and Ambassadors . “I have older girls and one big problem for them is a lack of interesting programming,” Rochelle explained. “We planned it out so that when the Seniors are finished today, they will be able to receive their Car Sense badge. Actually, all the girls will earn a badge along with the fun patch,” said Terri. It was important to both women that the event not only be entertaining, but also educational and purpose-driven. “It’s easy to fill up the back,” Rochelle said, referring to the fun patches sewn on the rear of all Girl Scout vests, “but it’s the front that’s a challenge.” Badges, badges and more badges: that’s the new motto for these Program Task Force members! 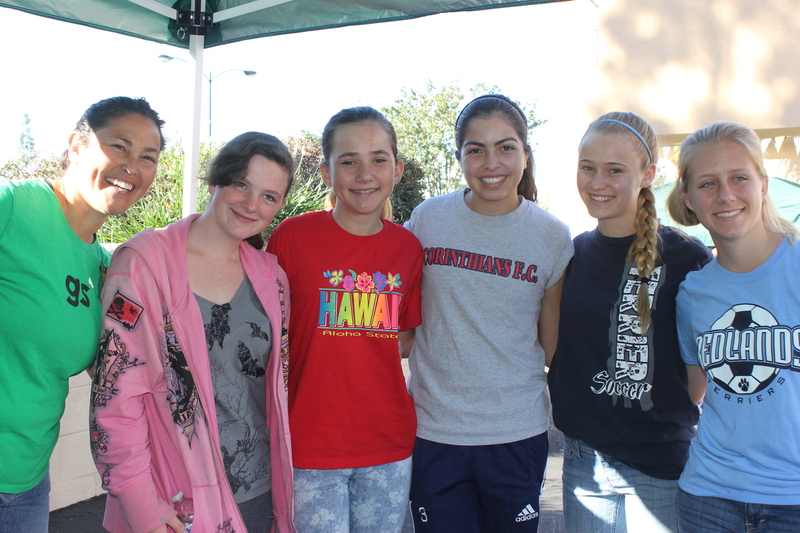 The event was hosted at the Tire Guys in Yucaipa; although a second event scheduled for the Tire Guys in Victorville had to be canceled due to low attendance (many of the older girls had SATs that day), Terri plans to reschedule in the High Desert. “We wanted to bring the Tire Guys in because they are always so generous during cookie season and so this event really solidified that partnership,” said Terri. Tire Guys employees hosted two of the four stations on Saturday – How To Change A Spare Tire and Basic Car Care which included checking water levels in the radiator, replacing oil and understanding the general anatomy of a car engine. “How would you know if you’re driving along that your engine was overheating,” quizzed Tire Guys’ Jim. Valerie Menefee, a local State Farm agent, volunteered to discuss the top ten safe driving tips, as well as hosted an Insurance Coverage station. Ms. Menefee discussed insurance with the young drivers, how to get a discount and what affects their rates. She also provided goodie bags for the girls that included a driver’s program DVD. 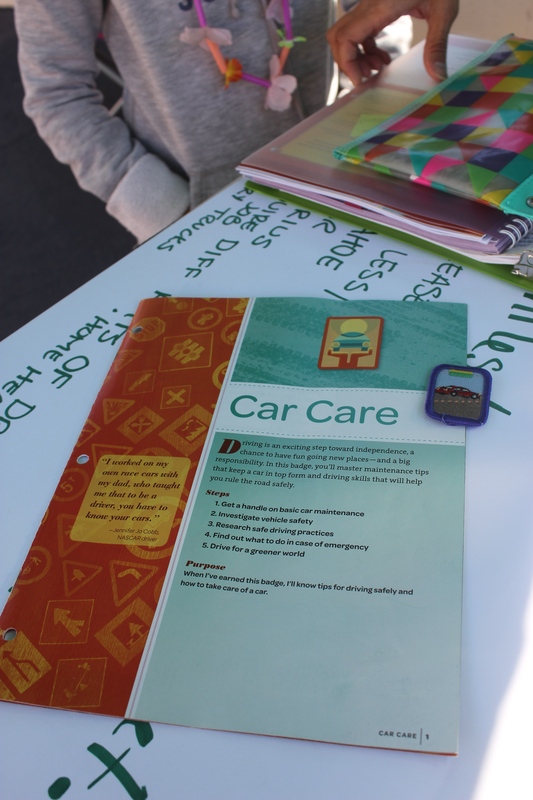 “I’m came here because I am starting to drive like the other girls and I think it’s important to know about cars so that if situations do arise, where you need help, then you’re able to help yourself,” said Kimberly, a Girl Scout. The task force’s Rochelle personally hosted a Fuel Efficient Driving station herself. “I’m a math nerd so I love crunching the numbers,” she laughed, holding up a board of calculations. The girls learned how to calculate mileage so that they would never get caught running short on fuel and compared cars with high fuel efficiency ratings (including hybrid and electric cars). Felice Gonzales, Leader of Troop 868, attended with her daughter and troop. “I am so glad the Girl Scouts offered this program since I have a new, young driver. It’s good to have other people reinforce a parent’s information and it also gives girls the ability to learn with their friends, and how to do things on their own without the help of boys or AAA. There will be times they are alone. “What a great program!” she beamed. Previous Previous post: Fall Sale Update: Here’s your chance to win!